In 1903 heiress and social activist Susan Lawrence Dana commissioned Wright to remodel her family’s 1868 Italianate mansion to better suit her social ambition and extravagant entertaining needs. National Historic Landmark. Register of National Historic Places. Open to the public with tours available. Blessed with a limitless budget, the project soon eclipsed the earlier dwelling, leaving only vestiges of the original house. The vast, two-story barrel-vaulted ceilings of the gallery and dining room, complimented by musicians’ balconies, created an ideal stage for concerts, lectures and elaborate social gatherings. The 35-room mansion was the largest building Wright had designed, and remains his best-preserved and most complete early Prairie-style structure. 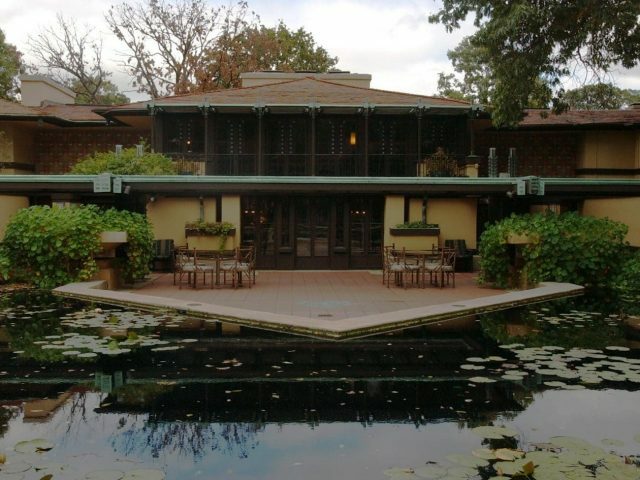 The Dana-Thomas House is an extraordinarily sophisticated integration of architecture, furnishings and decorative arts, and creates a unified statement of the Prairie School aesthetic. In 1944 the house was purchased by Mr. and Mrs. Charles C. Thomas. The house was renamed the Dana-Thomas house in recognition of the couple’s concerted preservation efforts over the 36 years that they owned the home. With more than 100 pieces of original Wright furniture, 250 art glass doors and windows, and 100 light fixtures still on display, the Dana-Thomas house contains the largest collection of site-specific, original Wright objects.